Wednesday started off with a summary of results from the Opportunity rover, given by Steve Squyres. He started off talking about the several iron meteorites discovered in the past year. I thought it was particularly interesting that there are hematite blueberries on top of some of the meteorites: the blueberries are way too big to be lifted by the wind, so that means the meteorite must have been buried and then exhumed! Another find out on Meridiani Planum was Marquette Island: a strange rock that is unlike any other seen on Mars, or any of the Mars meteorites. It is probably a chunk of ejecta from a distant impact crater, but it isn’t clear exactly what kind of rock it is. Squyres suggested that it was a crystalline igneous rock, but in a later talk Duck Mittlefehldt seemed to favor a “clastic” origin, meaning that the rock is made of small fragments stuck together. Finally, Squyres talked a bit about Opportunity’s current location, Concepcion crater, which is the youngest crater ever encountered by either rover. The coolest thing that he showed was a block of ejecta which had one side coated with a plate of blueberries, probably the result of hematite precipitating out of solution along a fracture. A later talk by Hap McSween took a look at the composition results derived from the TES and GRS instruments in orbit and the APXS on the ground. TES is an infrared spectrometer so it only sees the upper few microns of Mars, while the Gamma Ray Spectrometer samples tens of centimeters into the surface. The two datasets give different predictions for the surface composition. Oddly enough, even though surface APXS measurements only detect the upper few microns, they match more closely with the GRS results. 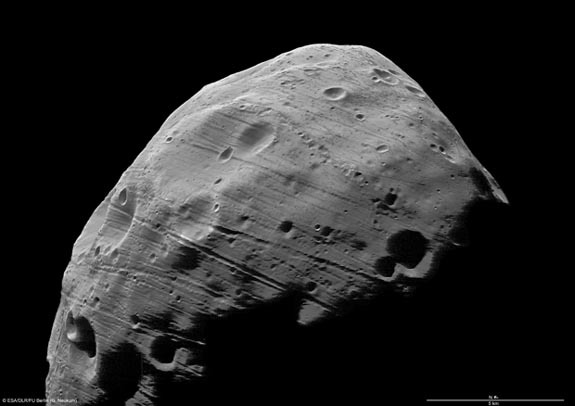 McSween suggested that perhaps thin, ubiquitous layers of dust were tainting the infrared signals, but not the GRS or the brushed surfaces of rocks analyzed by APXS. Another possibility suggested by Steve Ruff was that sulfates can actually look quite similar to silica in TES spectra! If that’s the case, sulfur might be messing up the calculated compositions from TES and Mini TES. The rest of the morning was filled with quite a few other talks about iron and magnesium-bearing minerals on Mars, but some of the most interesting talks of the day were in the afternoon planetary atmospheres section. The first atmospheres talk was given by James Lyons for Kevin Zahnle, who wasn’t able to make it. Zahle called the recent methane detections into question by pointing out that the observed methane band might be due to methane in the Earth’s atmosphere that wasn’t properly removed from the spectrum. Unfortunately the authors of the Mars Methane paper that was being questioned weren’t there to respond, so I don’t know whether they took this into account in their atmospheric corrections. Localized regions of possible methane production on Mars. Another talk by Malynda Chyzek focused on modeling methane on Mars. She found that, with some assumptions about the rate of methane destruction, the rate of methane production predicted in previous papers might be about 30 times too low! To put the revised production rate into perspective, she calculated that it would require about 5 million cows to produce the same amount of methane, placing the population density of cows on Mars at about 2 millicattle per acre. Another really interesting atmospheres talk by Spiga (I missed his first name) showed the effect of Katabatic winds on surface temperature. Katabatic winds are winds that blow downhill due to gravity, and they occur on broad high slopes like those on the polar caps or Olympus Mons. The thing is, as the wind heads down in elevation it gets compressed and compressing gas heats it up. The warmer gas then warms the surface, which can have a big effect on orbital measurements of thermal inertia, and that means that we have to be careful about using thermal inertia to infer what type of material the surface is made of in locations with strong downward winds. There were several talks about modeling the water cycle and rainfall on early Mars. Soto (again I missed his first name) made an interesting comparison between areas of predicted rainfall and areas where valley networks are visible. He found that with just wt soil, there isn’t much precipitation, but with a northern ocean, the rainfall patterns match pretty well with the location of valley networks. The lack of valley networks toward the south pole makes sense in a model like this because all the water is in the northern hemisphere, and it would rain out on the slope up to the southern highlands, leaving a desert in the center of the highlands (the south pole). A map of the valley networks on mars, and the possible extent of a northern ocean. Some of the other atomospheres talks considered the early atmospheres of rocky planets. Jenny Suckale gave an interesting presentation about the possibility that early atmospheres formed by “catastrophic degassing” of the magma ocean rather than gradual release of the gases. 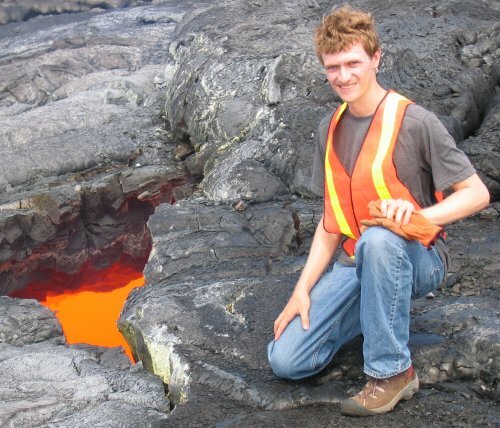 The idea is that as the magma ocean is cooling, it solidifies from below. That pushes the volatiles in the magma up into the upper layers until it becomes saturated and bubbles begin to form. Once the bubbles start to form, they can cause parts of the magma to become more buoyant, and as the magma rises more bubbles form. This might cause sudden a sudden violent release of gas from the magma (similar to the sudden catastrophic release of gas from a shaken can of pop). Well, I made it to Houston about a day later than expected so I missed all of the monday talks and sessions, but I took notes yesterday and I’ll share some highlights here. The day started off with a series of talks about terrestial planet cryospheres. In other words, ice on Mars and the earth. Robert Grimm gave the first talk, describing his latest model results for groundwater and ice on Mars. His model showed that it doesn’t take very much water to reproduce ice distributions like those seen on Mars today. But in the following talk, Steve Clifford had some criticism for Grimm’s model. In particular he pointed out that it is incorrect to say that once the water ends up in the atmosphere it is lost: it spends some time in the atmosphere before being lost, and in that time it can precipitate out at the poles as frost or snow. And if the polar caps grow thick enough they act as an insulating blanket, trapping the planet’s heat and causing their base to melt and recycle water into the subsurface. Next up Jeff Plaut gave a cool talk about thick lobes of ice that have been discovered using SHARAD radar in the Deuteronilus Mensae region. The ice is surprisingly pure, and it preserved by a layer of rocky debris on the surface. He said that the amount of water trapped as ice in Deuteronilus Mensae (6,325 cubic kilometers) is comparable to the volume of Lake Michigan: a small amount compared to the total amount of ice on Mars, but still not insignificant. Later in the afternoon, after having a nice lunch with some of the ChemCam team, I headed over to check out the Dunes session. It began with a talk by Jani Radebaugh about dunes on Titan and the Earth. 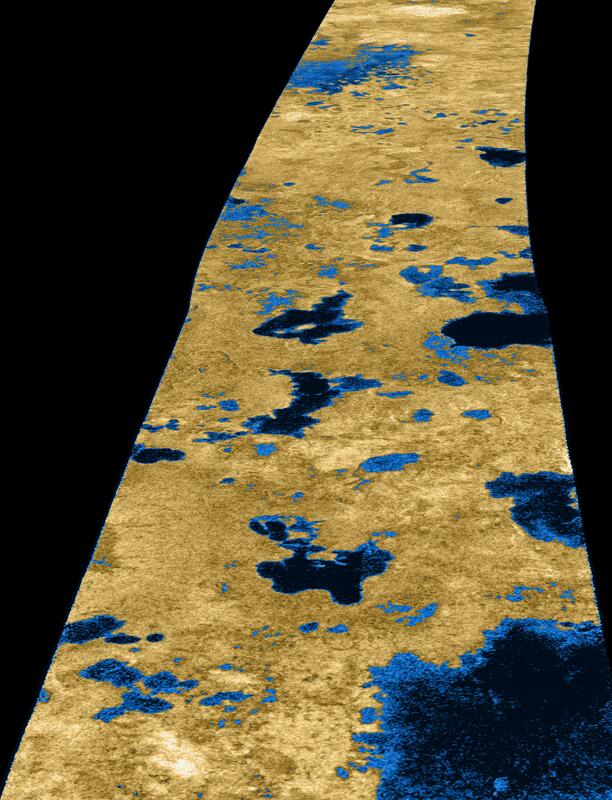 It turns out that Cassini radar observations of Titan reveal huge expanses of linear dunes near the equator. The dunes are probably made of grains of ice and organic molecules, and they tell a puzzling story. The shape of dunes can be used to infer the wind direction, and that’s just what Radebaugh has done, but the confusing thing is that her inferred wind directions are completely opposite what is expected from atmospheric models! Another talk in the dunes session, by my friend Lauren Edgar, took a close look at the crossbeds preserved in the walls of Victoria crater, where the Opportunity rover spent quite a lot of time. She suggested that the patterns of beds seen in the walls might be explained by a “draa” which is essentially a giant dune with smaller dunes on top of it. This would be evidence of a big, well-developed sand sea in Meridiani in the distant past. Matt Chojnacki, a fellow pancam PDL, gave another interesting talk where he showed some observations of sand dunes in Endeavor crater that disappeared. This is a big deal because despite all the wind and sand on Mars, there is only one other case where sand dunes have actually been observed to move from orbit. Finally, Matt Golombeck gave an interesting talk, using evidence from the fresh craters that Opportunity has visited in Meridiani to constrain how old the ripples are. He found that the ripples that are ubiquitous in Meridiani probably last moved sometime between 100-300 thousand years ago. He also made the interesting observation that the fresh craters have no hematite blueberries exposed in their ejecta. Essentially the explosion from the impact blows away the blueberries on the surface, and until the ejecta rocks erode to expose new blueberries, they are much rarer near the crater. That pretty much sums up Tueasday. I wish I could report from the poster session, but I had a lot of visitors at my own poster and didn’t get the chance to look around at any of the other posters! 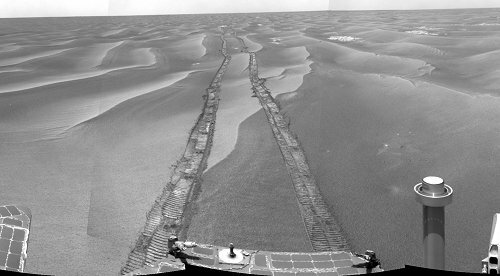 Opportunity's tracks across the ripples on the way to Endeavor crater. Every year at LPSC one of the big events is the Masursky lecture, given by that year’s winner of the Masursky prize recognizing “individuals who have rendered outstanding service to planetary science and exploration through engineering, managerial, programmatic, or public service activities”. Artist's concept of an extrasolar planet and its moons. Stern made it clear that he favors a broad definition of what constitutes a planet, essentially saying that if it’s round, it’s a planet. Not a surprising view for the leader of a mission to Pluto. But at the same time, he did not try to push his views too hard. Instead he took a look at the state of planetary science and suggested that the whole debate over nomenclature is really an indicator that we’re in the midst of a revolution driven by the startling diversity of planets being discovered. All of a sudden, we are discovering planets and planet-like objects everywhere we look. Right now there are 344 known extrasolar planets, many of which have bizarre, unexpected attributes. Some orbit pulsars, others have scorching orbits that circle their star every few days or hours, others plunge deep into their solar system, and then retreat to icy distances are they follow extremely oblong orbits. Some extrasolar planets are puffed up until they have the density of balsa wood, others are extremely dense. Even in our solar system, we’re finding a whole new population of objects out in the Kuiper Belt, and we know of many moons that are interesting worlds themselves. Stern’s premise is that this startling diversity is what is driving the debate over what is and isn’t a planet and that, essentially, we just have to keep debating as we gather more information. How do we organize planetary objects? What properties are the most important in classification? What subtypes make the most sense? And who decides whether a new object is a planet? Stern suggested that these are the types of questions that planetary scientists need to be mulling over and chatting about in the halls at conferences because that’s where it will be figured out, bit by bit. Eventually the scientific method will prevail and a logical system will emerge. Exoplanet discoveries by year as of Early 2009. I hope that’s how it works, but in the meantime, Stern made another point that I think was the most valuable one of the lecture, though he did not spend much time on it. He talked about the common complaint about the possibility of having more than nine planets: “But how will kids learn all those names?” His snarky response was: “I guess we’d better go back to nine states then.” But the serious response was that this is a fantastic teaching moment! This is an issue that the public is really interested in, and it’s a great example of how science works! We can use this to start conversations about planetary science and to help people start thinking critically and scientifically. I’ll admit, I get tired of the “what is a planet” debate, but Stern is right. We are experiencing a revolution in what we consider a planet. It may be confusing and frustrating, but it’s an excellent teachable moment, and I plan to make the most of it the next time someone asks me about poor little pluto. Day 2 was all about ice in the mars sessions: the morning focused on the polar caps and the afternoon focused on the subsurface. I also managed to catch a few non-mars talks. One of the first talks I saw was by Ken Tanaka, famed for his geologic maps of Mars. He showed the results of his studies of the north polar cap, and identified at least two major hiatuses. The official geologic definition of hiatus is: “A cessation in deposition of sediments during which no strata form or an erosional surface forms on the underlying strata; a gap in the rock record.” Tanaka showed examples of locations that demonstrate the different ages of layers, but the main take-home message of his talk was that most of the time, things are not being deposited on the polar cap. HiRISE color view of defrosting sand dunes. The dark streaks are locations where the ice is gone and the dark sand grains are able to blow across the icy dune surface. Ken Herkenhoff gave an interesting presentation about HiRISE observations of active processes at the poles. He emphasized that there are many processes that they will understand better after another year of repeated observations, but still had some interesting results. He talked about active streaks in gullies and the strange fans and spots that form on defrosting dunes. Interestingly, these spots tend not to form on the base suface beneath the dines, implying that the material underneath the ice has to be mobile enough to blow around once the ice is partially removed. HiRISE also observed avalanches in action on the north polar cap! As ice begins to thaw in the spring, debris from the ice cap can come loose and cause an avalanche. These are apparently pretty common, because multiple avalanches were actually caught in action in the same image! 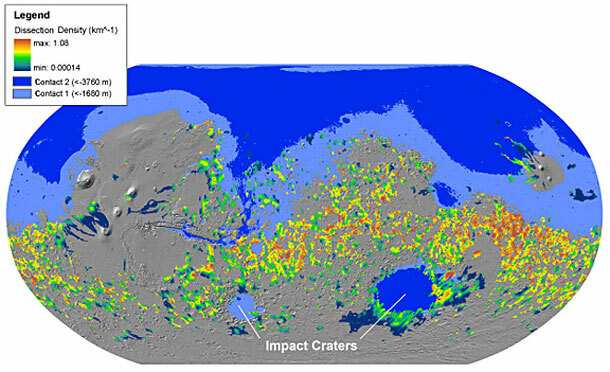 An avalanche in the Martian arctic caught in action. Finally, Herkenhoff showed a picture that apparently has everyone baffled. There are lots of streaks seen on the polar cap, but some like the ones in the following image don’t make much sense. It looks like most of the streaks in the image are going down-slope, so you might think they were formed by small avalanches of dust or something. But why do they have such sharp edges? And, more importantly, why are some of them diagonal compared to the rest?! Strange streaks on the north polar cap. Nobody knows why these have such sharp edges, or why some of them are diagonal. I darted out of the Mars talks just in time to catch an interesting Enceladus presentation by Sue Kieffer. She took a look at the thermodynamics of warm ice in a vaccum and believes that the ratio of ice to water vapor in Enceladus’ famous plumes is half of what was originally reported. Kieffer claimed that the original calculation made a faulty asumption about the range of particle sizes in the plume, which led to a very different estimate. Why is this a big deal? Because it turns out that Kieffer’s calculations fit much better to sublimation than boiling liquid water! Enceladus might not have liquid water at its pole, it might just have warm ice! I’m sure the icy moons community will be looking into this some more and trying to figure out which calculation is correct as soon as possible. It would be really cool if we could prove that there’s liquid water on Enceladus, but the universe doesn’t care what we think is cool, so maybe the little moon is just a warm ice-ball. The plume of ice and vapor coming from Enceladus' south pole has caused quite a stir, but one talk this year suggested that it could be formed without any liquid water. Finally, I saw Steve Wood give a really interesting talk in the afternoon about atmospheric collapse on Mars and its effects. Mars’ tilt changes over millions of years, and occasionally it decreases to the point that the global temperatures drop, and CO2 from the atmosphere is dumped on the surface in a thick layer. This talk considered what that blanket of CO2 would do the the martian subsurface and concluded that it would indeed act as a blanket. CO2 ice has a lower thermal conductivity than rock, so the ice and icy soil would act to trap the geothermal heat of the planet, and might cause a subsurface warming of 20 degrees: enough to melt ground ice and drive off the water from some hydrated minerals. This is a really interesting effect and I had never heard of it before! Just a word to say that I do plan on blogging LPSC, but (clearly) I’m not going to be able to keep up with daily posts. I’m still taking notes, and I’ll post them when I have some more time. Part of the problem is that I’m staying at the conference hotel, which is nice enough that you have to pay to use their internet, and the conference internet is only available in a certain hallway and (I believe) gets turned off at night, so even if I wasn’t really tired at the end of the day, my internet options would be limited. So that’s lame. Anyway, I’ll post about some more interesting talks when I have the chance. Unfortunately I missed the earliest sessions today because I had to drive down to Johnson Space Center to get a badge. I am going to be working there for four weeks after LPSC and another five weeks later in the summer, characterizing rock samples and shooting them with a laser, so I needed a badge to be able to do that work. I got back to the conference just in time for Bill Boynton’s talk about the evidence for Carbonates at the Phoenix landing site. He presented results from TEGA, the Thermal Evolved Gas Analyzer, which is a set of 8 ovens that are used to heat a sample up to ~1000 degrees C and analyze the gases that are created. When compounds undergo a phase change, they tend to absorb energy without increasing in temperature. Think of ice in a glass of icewater; the system doesn’t start warming up until the last bit of ice has melted. Until that point, any additional energy goes toward the phase change between solid and liquid rather than warming up the mixture. TEGA operates on the same principle: by calculating how much energy is required to heat a sample it can detect phase changes. It also sends any gases created during heating to a Gas Chromatograph Mass Spectrometer to be analyzed. Phoenix found evidence for carbonates, likely formed in the presence of liquid water, in the soil of the Martian arctic. During analysis, there was a significant release of carbon dioxide at high temperatures, indicating the decomposition of calcium carbonate (the same material that makes up limestone on Earth). Calculations show that if the carbonate was formed purely due to atmospheric humidity, it would be much less than 1% of the soil, but the TEGA results require something like 3%-5%, indicating that the carbonates formed in water. Another interesting talk was from Delphine Nna Muondo, who talked about the use of laser pulses to simulate impact shocks. I will be using pulsed lasers for my upcoming research so it was interesting to see how another research group is using the same type of laser for very different purposes. Their work was focused on determining the chemistry induced by impacts, which they simulated with laser pulses. Laser pulses have the advantage over high-speed gun experiments that the can deliver energy equivalent to 100 km/s impacts, much higher than what can be achieved with actual impactors. Also, laser pulses are easily repeatable, and there is no contamination of the target by the impactor. The disadvantages of using lasers to simulate impacts are that natural impacts have longer-lasting shock waves, and they couple their energy to the target differently. Nonetheless, Muondo showed that laser pulses do induce some chemistry, which may explain the presence of some organics in the outer solar system. Laser pulses can be used to simulate extremely high velocity impacts. Later in the day, one of the most interesting talks was one from Nilton Renno, discussing the possibility of liquid H2O at the Phoenix lander site. He suggested that the odd growths observed on the lander’s leg may have been extremely salty water droplets. 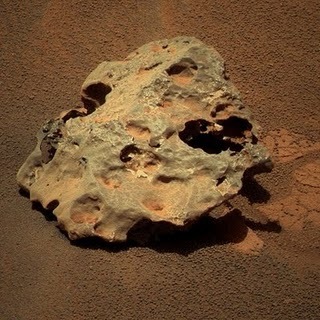 Salts are very common on Mars and Phoenix showed that the soil was rich in perchlorates, which can lower the freezing point of water down to -75 degrees C. He suggested that daily variations in surface temperature, which oscillate above and below -57 C, would cause a layer of very salty water to be concentrated just beneath the surface. During landing, Phoenix’s rockets blasted through the soil and uncovered ice, and in the process “splashed” this brine onto the lander’s legs. The uncovered ice began to sublimate, and the water vapor then was absorbed by the concentrated brine droplets, causing them to grow! The growth slowed down toward the end of the mission because the exposed ice was no longer sublimating and providing water vapor. Putative droplets of brine growing on Phoenix's leg. The talk was pretty similar to one which I reported on back in December at AGU. I am of pretty much the same opinion; that it sounds like a plausible argument to me, but that it may not be as compelling as Renno thinks since the Phoenix team hasn’t been shouting this result from the rooftops.